In trying to write my review of this book, I find myself grasping for words. I can't even intelligently say what this book was really about. Sure, it's about Quantum time travel, and a group of archeologists studying a historical site are able to travel back to medieval times and see the site in it's fully glory.. While there they get into all kinds of trouble and getting back isn't as easy as getting there was. There are some twists and turns regarding the time travel and the corporation that is secretly working on the time travel. I love the idea of time travel in science fiction so I thought I would love this one. but this is the first Chricton book that didn't grab me and didn't keep me interested. Im sitting here after finishing it feeling disappointed, I didn't love the story and I didn't love the characters. It just didn't keep me interested. I just couldn't keep all the details straight and I thought too much was going on, in both the past and present. I just feel like I missed a bunch of pages in the middle or something. I could have done without reading this one. Time travel not too far away! Well, as a movie it just didn't work! But the book is lots of fun and has a good premise. The author's fascination with the 14th-century, due in no small part to renowned historian Barbara Tuchman's amazing book: "A Distant Mirror" is both what makes the "Timeline" book fun, and why the movie didn't work. Folks probably went to the movie thinking they were going to learn something about the possibilities of time travel, and they didn't. It was much more a fish-out-of-water story but with too many characters, and too many of them rather dull, and not nearly enough romance./Also, I loved Dr. Crichton's bibliography at the end of the book. Experienced this as an audiobook in the unabridged form. Awesome entertainment! The story is a perfect fusion of sci-fi and historical fiction. Chrichton does not disappoint with this one. (I have to admit I did fast forward on tape three regarding the discussion on quantum physics--it's a little beyond my comprehension). The narrator was very creative and animated which certainly added to the experience. I was looking for something to keep me awake for a 12 hour drive through the desert and this book did the trick! In fact, after I reached my destination I found myself driving around and around just to listen to finish the story. It has been a great hit with friends, sadly I loaned it to acquaintance and it was never returned. I would like to listen to it again someday. Warning: it does contain some gore as the Middle ages were a violent time. Let's take a ride in a time machine. 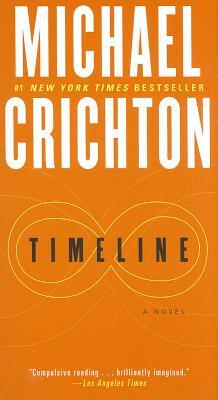 Crichton takes about 50 pages to develop a "Quantum Teleportation" theory based on Quantum Physics, and has a company, ITC, based out on the New Mexico Desert near Gallup secretly building a time machine. The owner of ITC is a 38 year old billionaire by the name of Robert Doniger, and a history buff. Dr Edward Johnston is in charge of a dig in France, funded by ITC, that is unearthing a 14th century castle by the name of Castlegard. Johnston has uncovered information that leads him to believe that ITC has perfected their time machine and convinces Doniger to let him Teleport back to 1357 to see what the castle looked like. Johnston can't come back, for some reason, and Doniger asks his crew, the crew that knows the castle, to go find Johnston. The crew volunteers to go and is teleported right into the middle of the 100 year war. Crichtons research of the 14th century time period is fantastic and very believable. I love his writing. A great story.